1 A None No Power Seat 1 A is a standard Business Class seat whose close proximity to the galleys may be bothersome. There is no floor storage for this seat during takeoff and landing. 1 E None No Power Seat 1 E is a standard Business Class seat whose close proximity to the galleys may be bothersome. There is no floor storage for this seat during takeoff and landing. 1 F None No Power Seat 1 F is a standard Business Class seat whose close proximity to the galleys may be bothersome. There is no floor storage for this seat during takeoff and landing. 1 K None No Power Seat 1 K is a standard Business Class seat whose close proximity to the galleys may be bothersome. There is no floor storage for this seat during takeoff and landing. 23 A None No Power Seat 23 A is a standard Economy Class seat that has slightly reduced seat width due to an immovable armrest. This seat also has restricted legroom due to the position of the bulkhead. There is no floor storage for this seat during takeoff and landing. The tray table and video monitor is in the armrest, making the armrest immovable and slightly reducing seat width. 23 B None No Power Seat 23 B is a standard Economy Class seat that has slightly reduced seat width due to an immovable armrest. This seat also has restricted legroom due to the position of the bulkhead. There is no floor storage for this seat during takeoff and landing. The tray table and video monitor is in the armrest, making the armrest immovable and slightly reducing seat width. 23 D None No Power Seat 23 D is a standard Economy Class seat that has slightly reduced seat width due to an immovable armrest. This seat also has restricted legroom due to the position of the bulkhead. There is no floor storage for this seat during takeoff and landing. The tray table and video monitor is in the armrest, making the armrest immovable and slightly reducing seat width. 23 E None No Power Seat 23 E is a standard Economy Class seat that has slightly reduced seat width due to an immovable armrest. This seat also has restricted legroom due to the position of the bulkhead. There is no floor storage for this seat during takeoff and landing. The tray table and video monitor is in the armrest, making the armrest immovable and slightly reducing seat width. 23 F None No Power Seat 23 F is a standard Economy Class seat that has slightly reduced seat width due to an immovable armrest. This seat also has restricted legroom due to the position of the bulkhead. There is no floor storage for this seat during takeoff and landing. The tray table and video monitor is in the armrest, making the armrest immovable and slightly reducing seat width. 23 G None No Power Seat 23 G is a standard Economy Class seat that has slightly reduced seat width due to an immovable armrest. This seat also has restricted legroom due to the position of the bulkhead. There is no floor storage for this seat during takeoff and landing. The tray table and video monitor is in the armrest, making the armrest immovable and slightly reducing seat width. 24 J None No Power Seat 24 J is a standard Economy Class seat that has slightly reduced seat width due to an immovable armrest. This seat also has restricted legroom due to the position of the bulkhead. There is no floor storage for this seat during takeoff and landing. The tray table and video monitor is in the armrest, making the armrest immovable and slightly reducing seat width. 24 K None No Power Seat 24 K is a standard Economy Class seat that has slightly reduced seat width due to an immovable armrest. This seat also has restricted legroom due to the position of the bulkhead. There is no floor storage for this seat during takeoff and landing. The tray table and video monitor is in the armrest, making the armrest immovable and slightly reducing seat width. 26 A None No Power Seat 26 A is a standard Economy Class seat. This seat may have restricted legroom due to the presence of an entertainment box underneath the seat. 27 A None No Power Seat 27 A is a standard Economy Class seat. This seat may have restricted legroom due to the presence of an entertainment box underneath the seat. 28 A None No Power Seat 28 A is a standard Economy Class seat. This seat may have restricted legroom due to the presence of an entertainment box underneath the seat. This seat is also missing a window. 28 K None No Power Seat 28 K is a standard Economy Class seat that is missing a window. 29 A None No Power Seat 29 A is a standard Economy Class seat. This seat may have restricted legroom due to the presence of an entertainment box underneath the seat. 30 A None No Power Seat 30 A is a standard Economy Class seat. This seat may have restricted legroom due to the presence of an entertainment box underneath the seat. 31 A None No Power Seat 31 A is a standard Economy Class seat. This seat may have restricted legroom due to the presence of an entertainment box underneath the seat. 32 A None No Power Seat 32 A is a standard Economy Class seat. This seat may have restricted legroom due to the presence of an entertainment box underneath the seat. 33 A None No Power Seat 33 A is a standard Economy Class seat. This seat may have restricted legroom due to the presence of an entertainment box underneath the seat. 34 A None No Power Seat 34 A is a standard Economy Class seat. This seat may have restricted legroom due to the presence of an entertainment box underneath the seat. 35 A None No Power Seat 35 A is a standard Economy Class seat. This seat may have restricted legroom due to the presence of an entertainment box underneath the seat. 36 A None No Power Seat 36 A is a standard Economy Class seat. This seat may have restricted legroom due to the presence of an entertainment box underneath the seat. 37 A None No Power Seat 37 A is a standard Economy Class seat. This seat may have restricted legroom due to the presence of an entertainment box underneath the seat. 38 A None No Power Seat 38 A is a standard Economy Class seat. This seat may have restricted legroom due to the presence of an entertainment box underneath the seat. 39 A None No Power Seat 39 A is a standard Economy Class seat. This seat may have restricted legroom due to the presence of an entertainment box underneath the seat. 40 A None No Power Seat 40 A is a standard Economy Class seat. This seat may have restricted legroom due to the presence of an entertainment box underneath the seat. 40 J None No Power Seat 40 J is a standard Economy Class seat however, this seat is sometimes reserved for crew rest. 40 K None No Power Seat 40 K is a standard Economy Class seat however, this seat is sometimes reserved for crew rest. 41 A None No Power Seat 41 A is a standard Economy Class seat that has restricted legroom and storage space. The proximity to the lavatories may be bothersome. 41 B None No Power Seat 41 B is a standard Economy Class seat that has restricted legroom and storage space. The proximity to the lavatories may be bothersome. 41 D None No Power Seat 41 D is a standard Economy Class seat that has restricted legroom and storage space. The proximity to the lavatories may be bothersome. 41 E None No Power Seat 41 E is a standard Economy Class seat that has restricted legroom and storage space. The proximity to the lavatories may be bothersome. 41 F None No Power Seat 41 F is a standard Economy Class seat that has restricted legroom and storage space. The proximity to the lavatories may be bothersome. 41 G None No Power Seat 41 G is a standard Economy Class seat that has restricted legroom and storage space. The proximity to the lavatories may be bothersome. 41 J None No Power Seat 41 J is a standard Economy Class seat however, this seat is sometimes reserved for crew rest. The proximity to the lavatories may be bothersome. 41 K None No Power Seat 41 K is a standard Economy Class seat however, this seat is sometimes reserved for crew rest. The proximity to the lavatories may be bothersome. 45 A None No Power Seat 45 A is a standard Economy Class seat that has limited legroom. The proximity to the lavatories may be bothersome. There is no floor storage for this seat during takeoff and landing. The tray table and video monitor is in the armrest, making the armrest immovable and slightly reducing seat width. 45 B None No Power Seat 45 B is a standard Economy Class seat that has limited legroom. The proximity to the lavatories may be bothersome. There is no floor storage for this seat during takeoff and landing. The tray table and video monitor is in the armrest, making the armrest immovable and slightly reducing seat width. 45 D None No Power Seat 45 D is a standard Economy Class seat that has limited legroom. The proximity to the lavatories may be bothersome. There is no floor storage for this seat during takeoff and landing. The tray table and video monitor is in the armrest, making the armrest immovable and slightly reducing seat width. 45 E None No Power Seat 45 E is a standard Economy Class seat that has limited legroom. The proximity to the lavatories may be bothersome. There is no floor storage for this seat during takeoff and landing. The tray table and video monitor is in the armrest, making the armrest immovable and slightly reducing seat width. 45 F None No Power Seat 45 F is a standard Economy Class seat that has limited legroom. The proximity to the lavatories may be bothersome. There is no floor storage for this seat during takeoff and landing. The tray table and video monitor is in the armrest, making the armrest immovable and slightly reducing seat width. 45 G None No Power Seat 45 G is a standard Economy Class seat that has limited legroom. The proximity to the lavatories may be bothersome. There is no floor storage for this seat during takeoff and landing. The tray table and video monitor is in the armrest, making the armrest immovable and slightly reducing seat width. 45 J None No Power Seat 45 J is a standard Economy Class seat that has limited legroom. The proximity to the lavatories may be bothersome. There is no floor storage for this seat during takeoff and landing. The tray table and video monitor is in the armrest, making the armrest immovable and slightly reducing seat width. 45 K None No Power Seat 45 K is a standard Economy Class seat that has limited legroom. The proximity to the lavatories may be bothersome. There is no floor storage for this seat during takeoff and landing. The tray table and video monitor is in the armrest, making the armrest immovable and slightly reducing seat width. 46 A None No Power Seat 46 A is a standard Economy Class seat. This seat may have restricted legroom due to the presence of an entertainment box underneath the seat. 47 A None No Power Seat 47 A is a standard Economy Class seat. This seat may have restricted legroom due to the presence of an entertainment box underneath the seat. 48 A None No Power Seat 48 A is a standard Economy Class seat. This seat may have restricted legroom due to the presence of an entertainment box underneath the seat. 49 A None No Power Seat 49 A is a standard Economy Class seat. This seat may have restricted legroom due to the presence of an entertainment box underneath the seat. 50 A None No Power Seat 50 A is a standard Economy Class seat. This seat may have restricted legroom due to the presence of an entertainment box underneath the seat. 51 A None No Power Seat 51 A is a standard Economy Class seat. This seat may have restricted legroom due to the presence of an entertainment box underneath the seat. 52 A None No Power Seat 52 A is a standard Economy Class seat. This seat may have restricted legroom due to the presence of an entertainment box underneath the seat. 53 A None No Power Seat 53 A is a standard Economy Class seat. This seat may have restricted legroom due to the presence of an entertainment box underneath the seat. 54 A None No Power Seat 54 A is a standard Economy Class seat. This seat may have restricted legroom due to the presence of an entertainment box underneath the seat. 55 A None No Power Seat 55 A is a standard Economy Class seat. This seat may have restricted legroom due to the presence of an entertainment box underneath the seat. 55 D None No Power Seat 55 D is a standard Economy seat, however, other flyers tend to bump into this seat. 55 G None No Power Seat 55 G is a standard Economy seat, however, other flyers tend to bump into this seat. 56 A None No Power Seat 56 A is a standard Economy Class seat. This seat may have restricted legroom due to the presence of an entertainment box underneath the seat. 56 D None No Power Seat 56 D is a standard Economy Class seat that may have restricted legroom due to the row configuration change. 56 E None No Power Seat 56 E is a standard Economy Class seat that may have restricted legroom due to the row configuration change. 56 F None No Power Seat 56 F is a standard Economy Class seat that may have restricted legroom due to the row configuration change. 57 A None No Power Seat 57 A is a standard Economy Class seat. This seat may have restricted legroom due to the presence of an entertainment box underneath the seat. 58 A None No Power Seat 58 A is a standard Economy Class seat. This seat may have restricted legroom due to the presence of an entertainment box underneath the seat. 59 A None No Power Seat 59 A is a standard Economy Class seat. This seat may have restricted legroom due to the presence of an entertainment box underneath the seat. 59 B None No Power Seat 59 B is a standard Economy Class seat however, the proximity to the lavatories and galleys may be bothersome. 59 D None No Power Seat 59 D is a standard Economy seat however, the proximity to the lavatories and galleys may be bothersome. 59 F None No Power Seat 59 F is a standard Economy seat however, the proximity to the lavatories and galleys may be bothersome. 59 J None No Power Seat 59 J is a standard Economy Class seat however, the proximity to the lavatories and galleys may be bothersome. 60 A None No Power Seat 60 A is a standard Economy Class seat in the last row of the aircraft. This seat may have limited recline. The proximity to the lavatories and galley may be bothersome. 60 B None No Power Seat 60 B is a standard Economy Class seat in the last row of the aircraft. This seat may have limited recline. The proximity to the lavatories and galley may be bothersome. 60 D None No Power Seat 60 D is a standard Economy Class seat in the last row of the aircraft. This seat may have limited recline. The proximity to the lavatories and galley may be bothersome. 60 E None No Power Seat 60 E is a standard Economy Class seat in the last row of the aircraft. This seat may have limited recline. The proximity to the lavatories and galley may be bothersome. 60 F None No Power Seat 60 F is a standard Economy Class seat in the last row of the aircraft. This seat may have limited recline. The proximity to the lavatories and galley may be bothersome. 60 J None No Power Seat 60 J is a standard Economy Class seat in the last row of the aircraft. This seat may have limited recline. The proximity to the lavatories and galley may be bothersome. 60 K None No Power Seat 60 K is a standard Economy Class seat in the last row of the aircraft. This seat may have limited recline. The proximity to the lavatories and galley may be bothersome. 7 A None No Power Seat 7 A is a standard Business Class seat however, the proximity to the lavatory and galleys may be bothersome. 7 E None No Power Seat 7 E is a standard Business Class seat however, the proximity to the lavatory and galleys may be bothersome. 7 F None No Power Seat 7 F is a standard Business Class seat however, the proximity to the lavatory and galleys may be bothersome. 7 K None No Power Seat 7 K is a standard Business Class seat however, the proximity to the lavatory and galleys may be bothersome. All Business and Economy class seats feature an in-seat AC power port. This version of Qantas' Airbus A330-300 features a two class configuration with 28 flat bed Business Class seats and 269 standard Economy Class seats and operates on long-range routes. I sat in 39K from Singapore to Brisbane and it was a really nice seat as there were no air stewards in the rest area, which is curtained off behind seat 39 J and K, and I could put my seat back without worrying about someone behind me. Just be aware that they put lights on in that area behind the seat so you need a eye mask if you like total darkness. The seat has a view of the wing so not great if you are after a good view. I loved my economy seat on this flight, just forward of the wing. The 2-4-2 configuration on the A330 means only one person to climb over and much easier for staff not having to lean over 2 other people, much better than 3-3-3 seating on 777s and 787s which I avoid. My MEL - Tokyo day flight was perfect - despite being 90% full the service was great. Good lunch meal and supper, offered water, fruit and snacks throughout the flight, lovely Bleasedale red wine, no queues for the toilets. Not sure why people whinge about Economy class in this aircraft - of course it's a bit tight but it's clean, quiet and comfortable (I'm 5'10"), food was fine, staff great. And considering the distance and inclusions, the fare was great value. Poor service from Qantas staff pre-boarding. Our pre-booked seats were changed and we were given a newly allocated seat without our permission or reason at boarding! Economy passenger beef stew food was hot but almost half the beef was unedible fat! No fruit was served although it was on the flight men and pre-landing food served was at the level of a budget airline. I feel that the economy seats on this plane are too close together making for very little incline. There is no premium economy so not much choice and few business so an upgrade is very unlikely. If you want to fly direct from Tokyo to Melbourne on Qantas there is no other choice. Will probably fly JAL from now on, better choice and better config for every class. My seat allocation was 57F. At my seat there was a large black box which I was told housed the entertainment system. However my housing was 3-4 times bigger than the other housings that I could observe. It was approximately 15 cm wide and 17 cm deep 12 cm high. It would appear that I happened to be the unlucky passenger that got the one and only seat with such a large housing. The problem for me was that I could not put both of my feet on the ground in front of me. I had to place my right foot to either side of the housing or place my right foot on the housing box if I wanted to sit without twisting my spine. Hence I had to alternate positions where I had my feet either side of the housing or on top of the large housing box. To make all of this even worse the seat in front of me was offset which meant both the TV screen and tray table was offset to the left of my seat by about 10 cm. Also the seat did not recline easily and I had to ask for assistance every time I needed to move the seat. NOT GOOD!! I write this while I am in extreme pain from enduring a 10 hour flight on a seat that should not be sold to anyone. Fabulous economy seat for the daytime flight from Brisbane to Hong Kong; plenty of legroom (I am 5'11") and spare seat meant I could spread out. Really good service from the cabin crew and food and bevvy offerings the best in the sky. In-flight entertainment system allowed me to catch up on a few of my shows.. fab! There is an entertainment box under both seats 24A and 24B reducing the space underneath the seat infront. Biz class seats on aisle (as opposed to window) have an armrest that drops, creating more width and ease of access when in bed mode. Same applies for 1E, 2F, 3E etc. This is a trade-off with privacy of window seats. Nightmare experience. Avoid Quantas long haul if you can. This BKK to SYD flight was jam packed resulting in congestion at the toilet areas whereby trollies struggled to get through. many crying babies all night.staff were visibly disenchanted. I am a small man but struggled in squashed up area and consequently could not sleep a wink. food was very poor , breakfast was a small muffin most of which had congealed into the paper wrapping so you ate as much paper as muffin. Rear economy aisle seat; I am 6' and 120kg.. surprised by how roomy the plane was. 9 hrs each way and enjoyed the IFE system all the way. 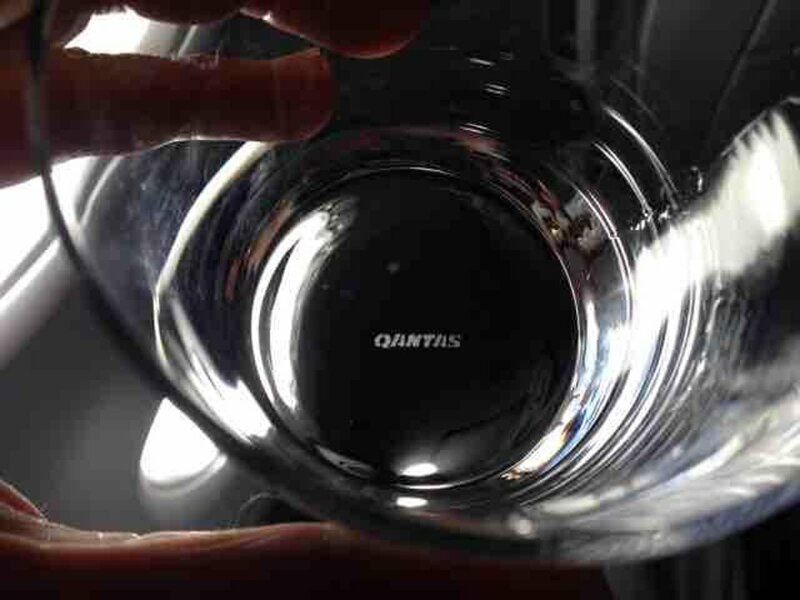 Well done Qantas! Paid an extra $90 for this terrible seat. No point having extra leg room when the space was taken by continuous stream of passengers using the toilet and standing there to talk and stretch. It should be marked red. Bulkhead is not a problem due to the special design. Toilet is at front of another aisle so this is also not a problem. Overall, 1F is a good seat. Less leg room than standard economy due to emergency Slide. It may be an exit row seat but avoid and save your money. Very uncomfortable narrow seat with cramped leg room. One of the worst flights (together with the poor quality in-flight food) I have experienced. Will try to avoid Qantas in future. No in seat power for 31J/K. The row in front and behind did have power, so maybe it's only every second row? Could charge my phone using USB in seat, but couldn't charge my laptop. Suprisingly decent. Not too far from toilets at either end so no noise.. Entertainment unit works really well... no need for my laptop with my own shows. My flight was only from Aus to Singapore and I am only 5ft7 so space was ample for me. The window seats in row 45 have legs blocked by a box protruding from the emergency exit door in front - the legroom is extremely restricted to the point I'd make the seats red not yellow. The aisle seats, on the other hand, have fairly good legroom, so maybe yellow/green? 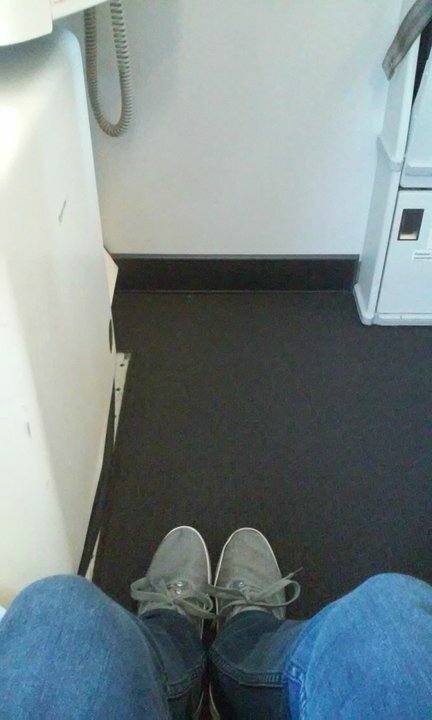 Paid extra for this leg-room seat but as it was near the toilets it was the worst seat on the plane and Qantas should pay passengers to sit there. There was always a line of people waiting to use the toilets for the 9 hour flight. Not worth it for the extra leg room. Most comfortable seat I have experienced. 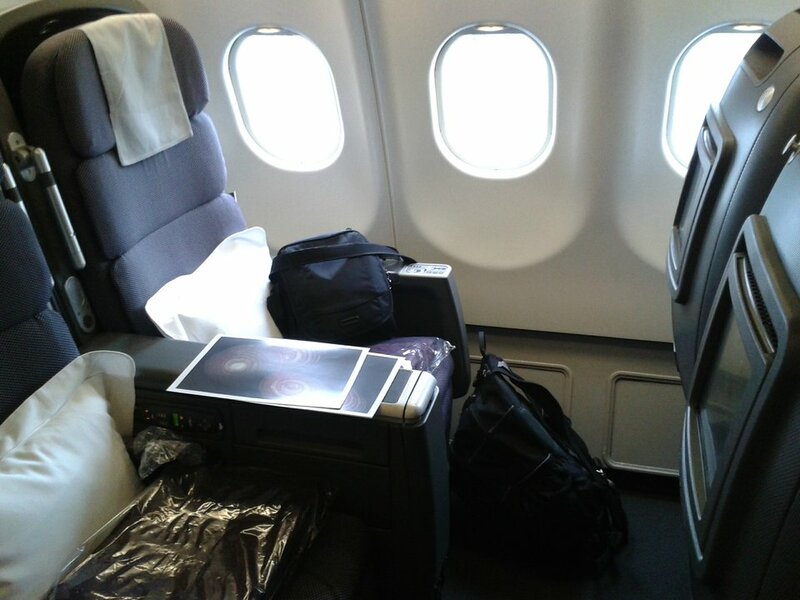 Much better the British Airways new seats. 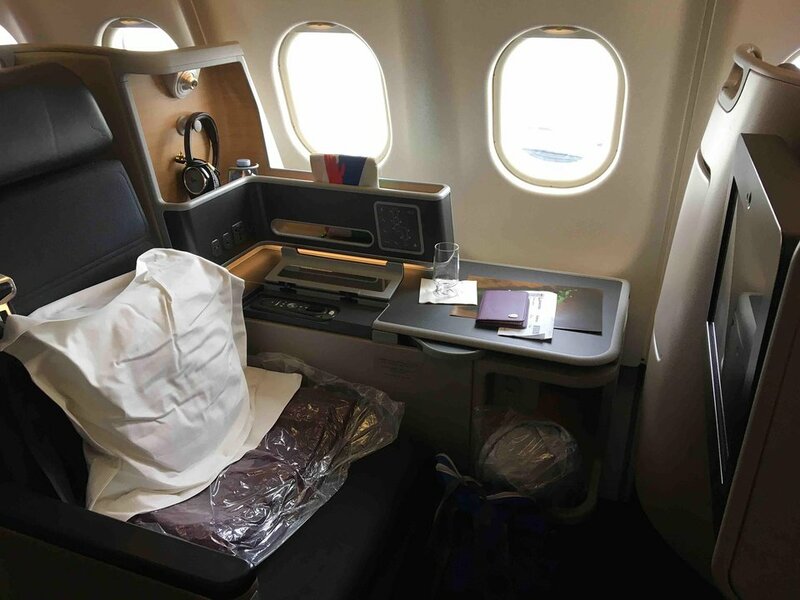 Overnight flight Sydney to Honolulu had pad put over seat and provided pajamas. At 6'2" the seat was just large enough for me. My wife said the best sleep she ever had on a plane. Great cabin crew also. If you are travelling with a companion and choose the middle pair of seats in the Business cabin, don't hope to converse with them much. There is a barrier screen between the two seats which is not lowerable as it is in the 747's i.e. they took the cheap option in seating choice. Row 1- video monitors are mounted on the suite front, not in armrest. Tray table is in the suite unit, not armrest as well. If exit seats cost extra, I always choose 23K. Seats may be slightly narrower, but not noticable until i read these reviews. And you only have to stow the monitor during take off and landing, which is not a long time in the overall flight. Leg room is good. Views are good. No toilet smell. First in line for food/drinks and exit for economy. And the most important point, nobody in front of you reclining their seat! Was moved to this seat because my other seat was broken. LOVED this seat. Was on overnight from Shanghai to Sydney. No service is done in forward kitchen, all done from back so absolutely no noise. There is a storage closet but they only accessed it 3-4 times and I was already awake. I was nervous being on the aisle but no one really came my way, the attendants hang in the back and there is another bathroom on the same side in the back that most people used from my aisle. Do not be afraid to book this seat. Extremely limited legroom. I fly Qantas A330s often, and the A330-200s have a tiny door protrusion for this equivalent seat, which I always book whenever possible. However, the A330-300 has a massive door bump, making the legroom much smaller than even a normal economy seat. If you also have 45J booked and are friendly with your companion, you can probably shift to stretch your legs out a bit. But on your own, it's very tight. 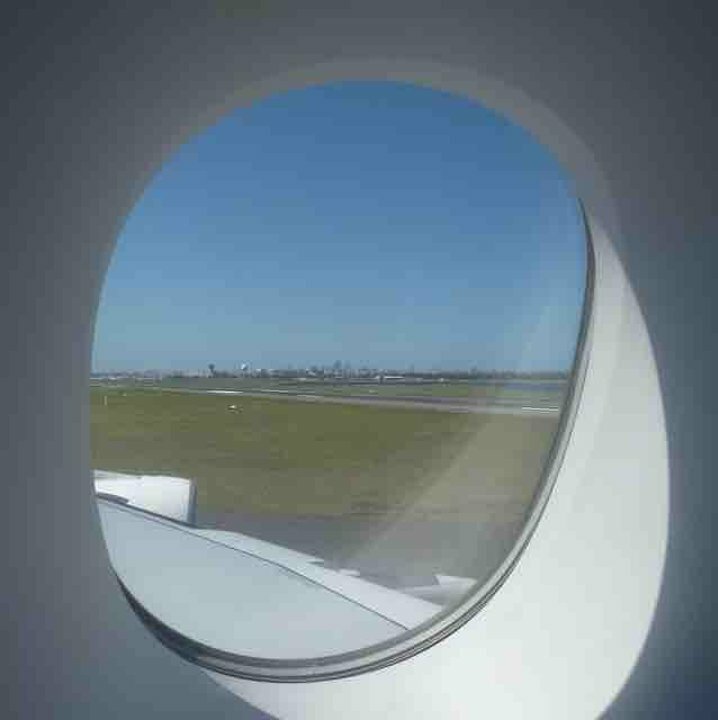 I thoroughly enjoyed my flight experience with Qantas on the A330 from Honolulu to SYD. I was lucky to have a chair with the storage/ privacy screen between me and the aisle. From the moment the plane lifted off you could recline your chair and start choosing lunch. I had lunch which was delicious. Soon after the meal they gave us some very comfortable mattresses and a pillow I was able to recline my chair and watch the T.V. It wasn't the widest range of shows and movies but I managed. After about 4 hours into the flight the lights dimmed to allow customers to sleep. Reading lights were able to be used. I had a problem with my Entertainment system I hailed a flight attendant and they helped immediately. Before dinner we received an ice cream. Dinner was nice too. At 8:45 we landed in SYD (2 hour late because of an APU problem). I have always flied with Qantas and I will anytime soon. The seat does not recline. You are stuck between a rock and a hard place when the seat in front reclines. Also the head set when plugged in was faulty. Not the fault of the head set as i had it exchanged. Faulty connection. This exit seat has drawbacks in that the legroom is diminished by the protruding plane door but also these 3 seats are opposite the disabled access toilet. The door is unlike the usual self closing doors and is a solid door that opens outwards. It requires passengers to close it properly onto the latch after use, otherwise it flaps open constantly revealing the toilet in full view and smell. I would not choose this row again. The space between seats were UNACCEPTABLE. The worst economy seats I have ever travelled on. Shame Qantas shame. I live in Australia but from now on I'll try to avoid Qantas whenever I can. The seat does not have extra leg room, it actually has less leg room than a standard seat due to the bulkhead. I am 6 feet tall and had to have my feet in the corridor in order to stretch out. You would need to be shorter than roughly 5'8" to comfortably use this seat. Comments apply to 23A as well. Qantas flies 1 versions of A333.